Did you know that the only one-cost two-power legendary creatures are Kytheon, Isamaru, Zurgo Bellstriker, and Norin the Wary? I found it kind of cool that Kytheon is in such company, though I almost hope they don't do it too often - it feels more special somehow than a lot of the big expensive effects! I wouldn't be surprised if Kytheon was played for his power-cost ratio alone - the two-power one-drop may not be as relevant in Standard as in years gone by, but its power can't be denied. He also happens to be fairly easy to flip, too, seeing as white likes to attack with creatures of around this size anyway and a deck whose creatures are around this cost is likely to have the mana to make sure he survives. In planeswalker form, he constitutes a cute but rather less overbearing callback to his first appearance in Zendikar, and is a solid finisher for white decks based around cheap creatures - and excuses them from having to cut some of their two-power one-drops to include a midrange plan B. 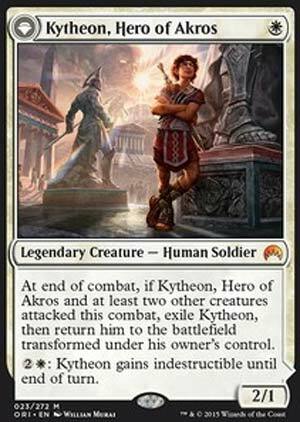 Today's card of the day is Kytheon, Hero of Akros which is a one mana White 2/1 Legendary which is already worth playing in human or soldier themes and also has a three mana Indestructible option. The transformation requirement is easily obtainable with a few creatures plus three mana as a safety net. 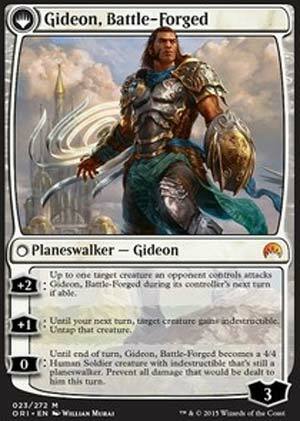 As Gideon, Battle-Forged has no loyalty lowering abilities and he can become very difficult to remove through combat alone. The +2 is situational, but a way to stall out a smaller threat or one with an effect that can trigger from hitting a player and not a planeswalker. The +1 is very useful with tap effect creatures to get a second activation or for a large offensive threat to give it pseudo Vigilance with Indestructible added on. The 0 cost of turning into a 4/4 with Indestructible is a solid aggressive addition to soldier build and has little drawback. Overall the one mana cost with a solid creature and the planeswalker +1 and the 0 make this a great card that should be popular across most formats and a likely staple of soldier builds going forward. In Limited this is a very easy first pick in Booster as even the one mana 2/1 is quite playable while the Indestructible 4/4 or extra untap with Indestructible can be a serious threat if enough creatures and mana can be fielded to safely trigger it. In Sealed this can fairly easily be splashed and both forms add enough value to the White pool to make including the color worth considering. So, a white weenie with an indestructible trigger. Neat thought, though the only reason you'd want this kind of ability on a 2/1 is because of his flip trigger. attack with him leading 2 or more, he flips. His +2 is combat trick bait, the +1 for untap and indestructible on a target creature is nice, And the creature-ization ability is always nice. No ultimates here, just a decent variety of utility.